I recently ordered up some Draper's BBQ Smokin' Sauce after hearing a rave review from Scott Roberts on a recent episode of Greg Rempe's BBQ Central Radio show. I was excited to try it, and it certainly didn't disappoint. 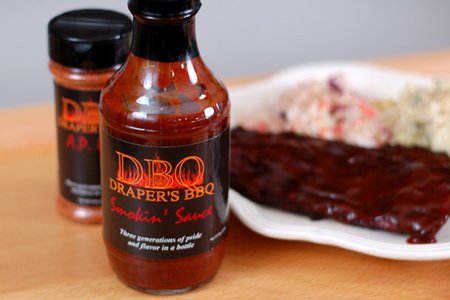 DBQ Smokin' Sauce is great on all types of meat and can be used as a baste or a dipping sauce. A blend of sweet, tangy and smoky with a touch of heat thrown in for good measure, this sauce is as versatile as it is delicious. I will say that their description is very accurate. On the label they make sure to point out that this is not a traditional regional sauce, and I agree. It's a relatively thick ketchup-based sauce that, if pressed, I would call a cross between a Kansas City and a Memphis-style sauce. However, that really doesn't do justice to the uniqueness of this sauce. The word "unique" can tend to be seen as a potential negative, especially in competition circles, but that's clearly not the case here. With this sauce it's a serious plus. I'd call it unique, but not overly so. It's just a special taste that really makes you take notice. As for flavor profile, it has a tangy black pepper taste up front, with a smokey chili powder sweetness in the middle, followed by a slightly spicy afterburn. There is also a very subtle herb flavor intermingled throughout. I truly think that this sauce would do very well in competition. It's just mainstream enough, but also unique enough to separate you from the pack. The only thing even approaching a negative about this sauce is how quickly it sets on cooked meats. The label instructs you to put it on in the last ten minutes of cooking, and that should be heeded. Alternatively, you could do as I did and thin it slightly to help it flow better and increase the set time. I also tried their A.P. Rub. The "A.P." stands for all-purpose, and that is certainly the case. I tried it paired with the sauce on both chicken and pork ribs, and they worked very well together. I was amazed at how well the flavor profile of the rub matched the sauce. The only difference is that the rub is slightly spicier than the sauce. It has a great balance of salt and sweet that compliments the meat without overpowering it. If you are looking to for a sauce and/or rub that will add a new and unique dimension to your barbecue, you really can't go wrong with Draper's. It's good stuff, indeed. Obligatory Disclaimer: I have no affiliation with Draper's, and this is not a compensated endorsement. I'm just spreadin' the love. These guys are getting a lot of love of late from the BBQ community. Good to see, as they seem like nice folks! Drapers is the first sauce I plan to buy once I get through my currently imposed "use what you have first before you buy anything else" rub & sauce buying ban.